This article is about the Point of Interest in Greenshade. For the crafting site in Grahtwood, see Fisherman's Isle. For the crafting site in Stormhaven, see Fisherman's Island. 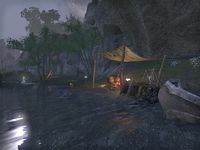 Fisherman's Rest is a spit of land on the western shore of Greenshade, north of Woodhearth. A note can be found here, along with a corpse.